The Diamond Dozen video slot from RTG has a well designed layout with quality graphics and excellent vibrant colours all enhancing your playing experience on this popular slot. 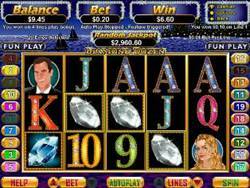 The game is a 5 reel 20 pay line combination with a wager of one coin per line up to a maximum of 20 coins. There is a fantastic bonus game, Diamond Delight, that kicks in when you trigger three or more White Diamonds. Click on each of the diamonds and your bonus is displayed, acting as a multiplier ranging from one to ten! The Blue Diamond is the scatter and when you spin up three of them you are awarded with 12 free games. Prizes are doubled when you win on a free game. It is also worth noting that there are random jackpots that can appear anytime as well as a progressive jackpot giving you a chance for an unexpected win. Diamond Dozen video slot has plenty of winning opportunities and is well some quality game time!